The Annapolis Micro Systems Wild40 EcoSystem™ for PCIe comprises of high performance FPGA cards, high bandwidth servers to connect all system nodes and a powerful software API to interact with it all. The FPGA cards can support up to three FPGAs from either Intel or Xilinx. It also supports up to two I/O sites. One I/O site contains three built-in QSFPs, each capable of line rates up to 14Gbps. The other I/O site is a high-density WILDSTAR™ Mezzanine Card. 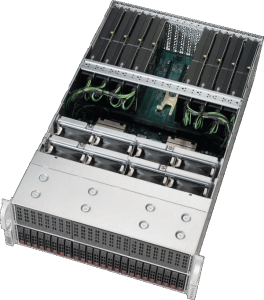 There are rack-mountable server options which allow up to up to eight double-wide cards in a single chassis. The Annapolis PCIe ecosystem allows for extremely high density with up to 24 FPGAs, 24 FPGA attached QSFPs, and eight WILDSTAR Mezzanine Cards in the 4U PCIe EcoSystem server and up to nine FPGAs, three QSFPs and one WILDSTAR Mezzanine Card in the 1U PCIe EcoSystem server. The included software API allows reprogramming of FPGA images over PCIe, high bandwidth data transfer with Direct Memory Access (DMA), runtime FPGA register access via PCIe, runtime configuration of board resources such as clocks and monitoring of board health sensors including FPGA temperature and board power. Additionally there are two FPGA design methods for every Annapolis product. There is a powerful VHDL environment with system level simulation which is included with every FPGA board, and CoreFire Next™ and Open Project Builder™ FPGA Design Suites, which allows high-level FPGA design using a graphical interface to drag cores (such as FFT or memory) into an FPGA design. Annapolis also offers a powerful Wild40/100 EcoSystem for OpenVPX.